Awarded for the most outstanding performance in a competition of Diploma Level instrumentalists. G. H. Aikins, K.C. 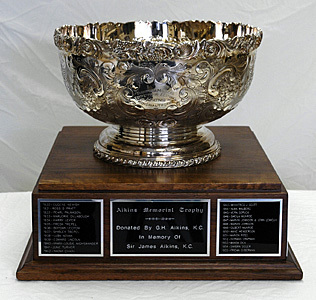 donated the Aikins Memorial Trophy to the Winnipeg Music Festival in 1930 in memory of Sir James Aikins, K.C. The son of the Honorable James Cox Aikins, Sir James Aikins was born in 1851 and educated at Upper Canada College and at the University of Toronto. He was called to the bar in Ontario in 1878 and in Manitoba in 1879. Sir James was the Lieutenant Governor of Manitoba from 1916 to 1926. He died in 1929.